service would be right up my alley… a year ago. With the arrival of my bundle of joy came some limitations for now. A more current reality is camping where walking back to the car to get all the good for dinner is the only hiking involved. Maybe some of you are capable of hiking Everest with a baby strapped to your front and everything you need to survive for a month strapped to your back and all I have to say about that is more power to you. As for me, I’ll stick to my campsite twenty minutes away from home. 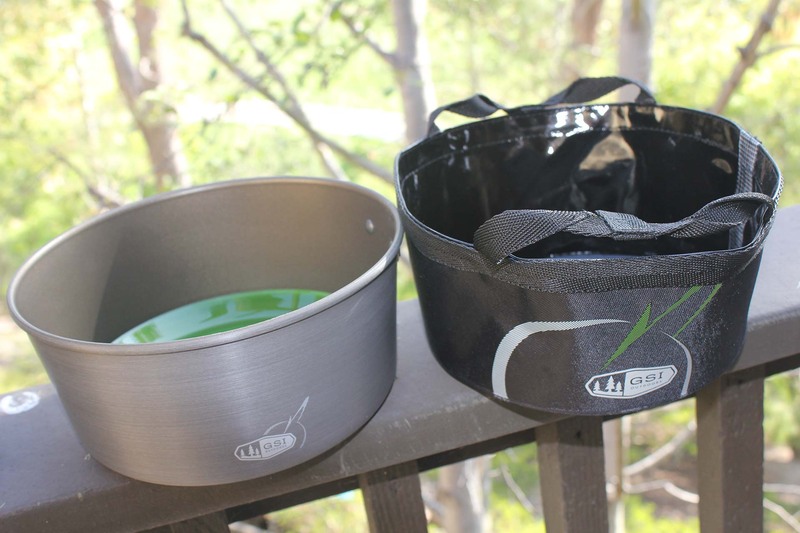 One of the advantages to this is that I can bring more than I can personally carry, including cookware. There is no better way to end a day outdoors with my family than a proper meal, and the GSI Pinnacle Camper is the ultimate, integrated cooking and eating solution. The saying, “everything but the kitchen sink” doesn’t even stack up to the Pinnacle Camper. 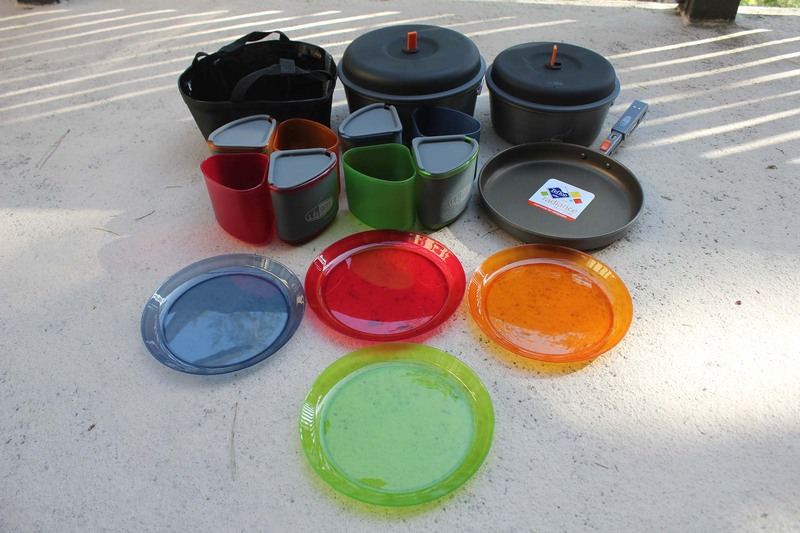 It includes two pots, one frying pan, four cups, four bowls, four plates, a removable handle, two pot lids, and a welded PVC stuff sack that doubles as a wash basin. All this only weights three pounds, eight ounces, and the entire set packs up to a compact 6 x 9 inches. 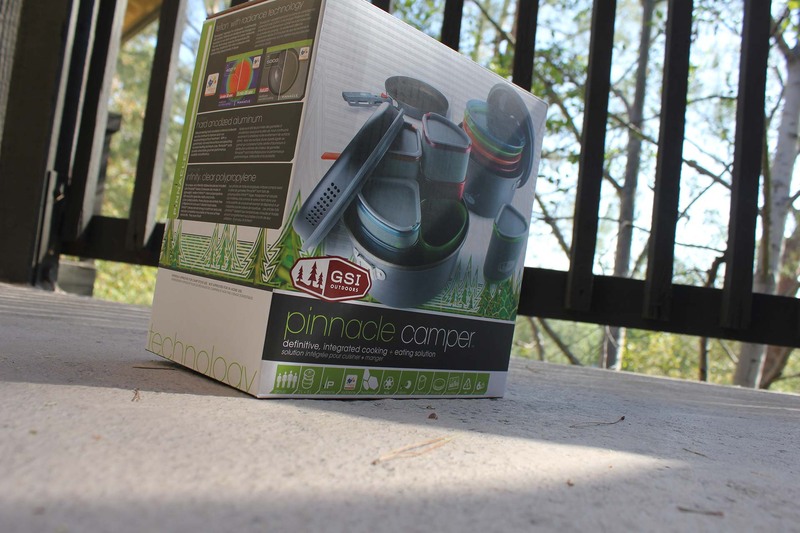 The components of the Pinnacle Camper can be divided into three main categories: cooking gear, eating gear, and the sink. 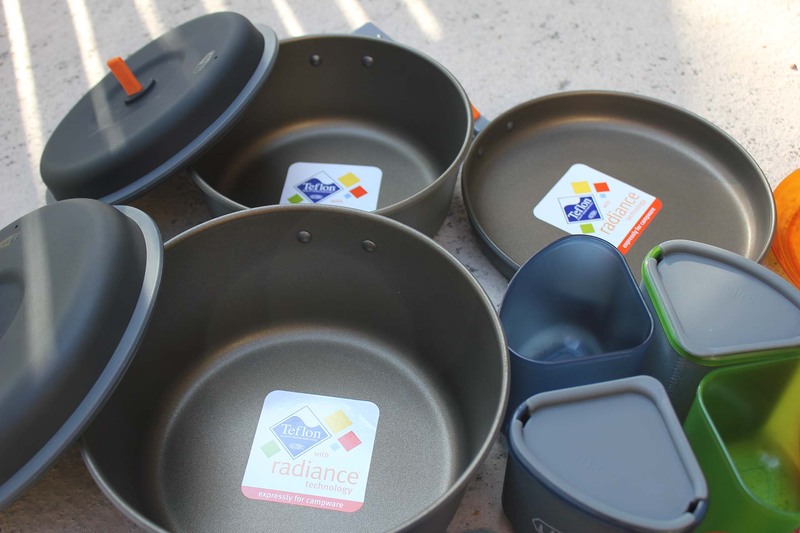 The cookware is comprised of a 3L and a 2L pot, as well as a frying pan. There are two lids, the larger of which fits both the larger pot and the frying pan. 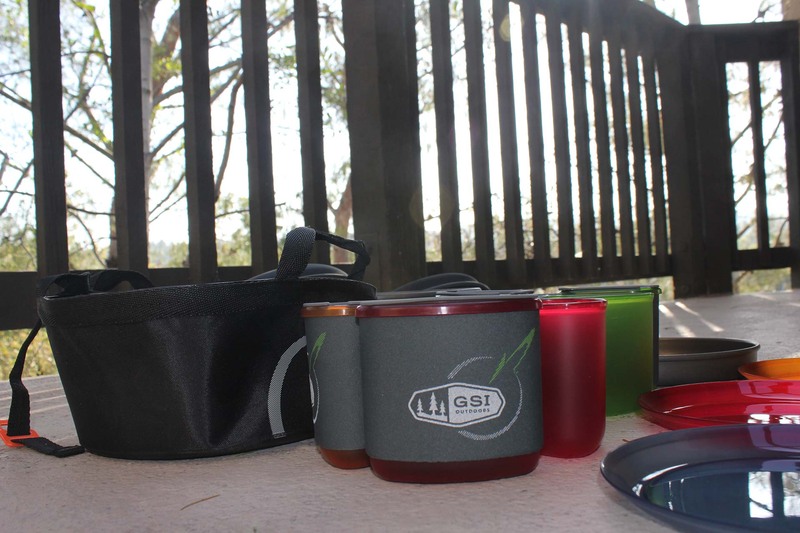 The set comes with Infinity eating ware, which is GSI’s name for their lightweight polycarbonate plastic. The plates are four different colors and the mug/bowl combinations are colored to match the plates. 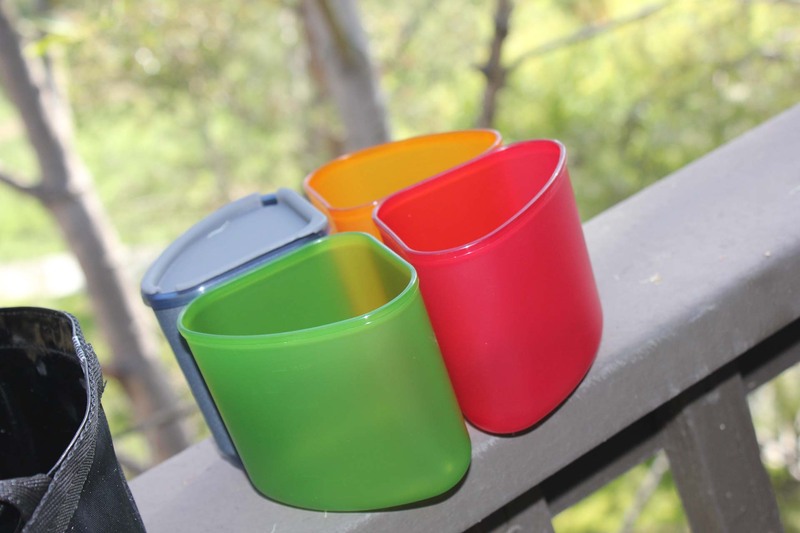 Each mug/bowl forms one quarter of a cylinder, so packing all four together fills the space inside the smaller pot. The outer piece is the bowl, which has a single wall. The bowl could also be used as a measuring cup since it’s marked with 200 and 400 ml, as well as 1 and 2 cups lines. Fitting tightly inside the bowl is the mug. The lid to the mug has two small vents at the corners for sipping even when the lid is on. The sink actually doubles as a cover for the larger pot, protecting the outside of the cookset from scratches. I was amazed at how well the different pieces are integrated into the overall system. The durability of the set seems unmatched as it was build to survive the toughest conditions with an unprecedented level of scratch and abrasion resistance. Each piece is hard anodized for durability. The cooking surfaces are then treated with Teflon with Radiance technology, a coating developed by Dupont that is not only non-stick, but actually heats faster too. 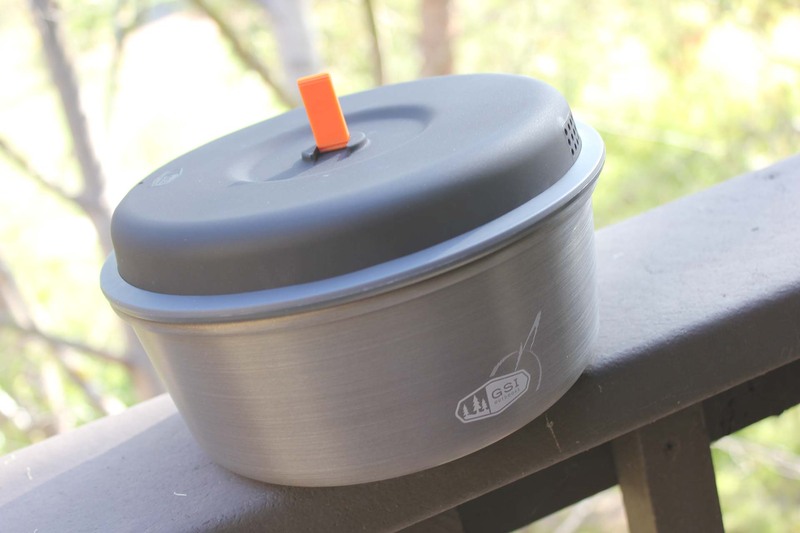 The crushproof, heat-resistant strainer lid and silicone ring will not deform in packs and works with either the pot or the frypan. 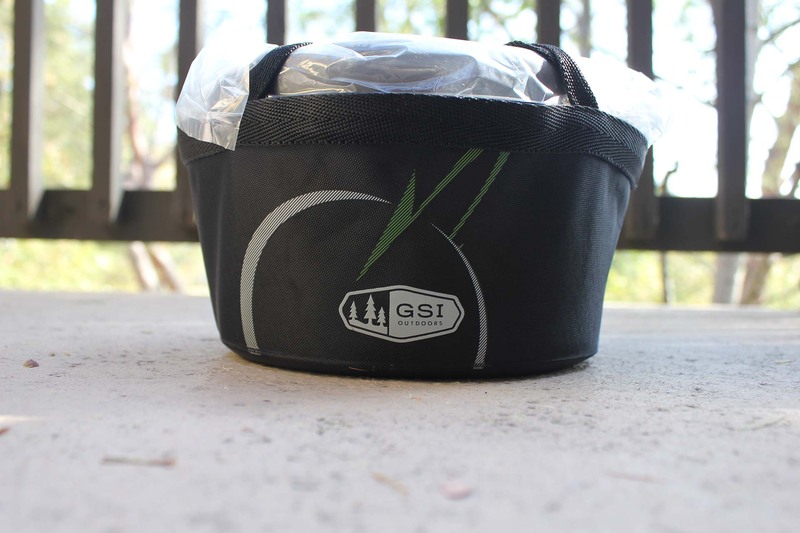 The kit comes with a set of instructions and I needed a little practice putting it all back together, but if you want to enjoy a gourmet cooking experience while car camping, the GSI Pinnacle Camper cookset will fit the mold perfectly. It’s designed in an innovative and convenient way while never skimping on quality and performance. This entry was posted in Uncategorized and tagged Adrenaline, adventure, backpacking, bucket list, Bucket List Publications, California Outdoors, Camping, car camping, Children, culture, Family, Hiking, landscape, Outdoors, photo, photography, Product Review, reviews, travel, vacation by lesleycarter. Bookmark the permalink. It’s been a long time since I needed stuff like this. But it makes me want to need stuff like this again! It’s better than my actual pot/pan set and I paid hundreds of dollars for it. At $129 for the entire set, you can’t go wrong. My family is growing and car camping will be a regular event for a couple of years until my baby is old enough to enjoy hiking. Do you go camping often? Sadly, no, it’s been years since I’ve gone camping. But always loved it when I did. Come the day Husband and I ever get to do the bike trip we want to do, camping will certainly be part of it. Yes, babies do change things, but just think one day you can all go on that “computer free” distant hiking trip. What a great experience for any child! I never went camping as a kid, but I think it would have been fun to be able to do at least once. these remind me of the equally usefull sets of camping and cooking equipment made of recycled aluminium, post war, that as a family we still used up until the eighties. great stuff. Thats looks like a very neat idea. We’re going camping at the end of the week with our 3 year old and 2 year old. Camping is very definitely different, if I get chance i’ll send you a picture of our car loaded ready for the trip, it will be completely jam packed! I’ll post again soon about the adventures we had! Neat gear! When your little bundle of joy is a bit older, I’m sure you’ll venture further afield again – we went camping last year when my eldest had just turned 4, middle one 2 and a half, and my baby boy was just 4months old. We also went later on in the year, and it was a lot easier when he was just 4m old and not moving! 😀 Can’t wait to go again this summer – if summer ever happens here in the UK! My cousins and I have an annual “guys camping” and this looks like the perfect piece for me to buy, since I’m in charge of the cooking all weekend! I was looking to buy a cast-iron set for cooking on the fire pit instead of lugging a charcoal grill. An idea how these would stack up? What a great set! Looks like it could be perfect for a group kayak trip – love the way it packs into itself! Looking for new gear this season as my old set has slowly become bits and pieces and is no longer complete! 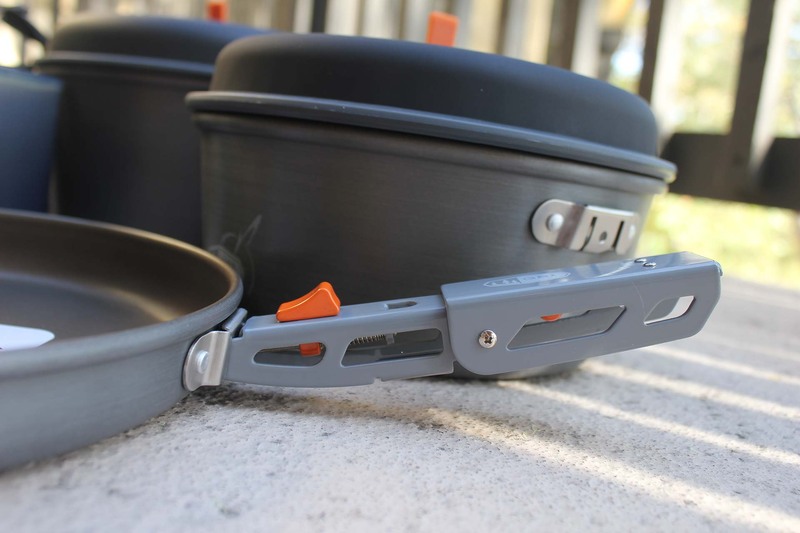 there is something so fascinating about camping cookware… I often go into outdoor shops and just look at all the little pots and pans and folding kettles, it’s all I can do to resist buying them even though I don’t go camping! Thanks for stopping by my blog. Congratulations for camping with a baby. I wish I had had your spirit of adventure back when my guy was an infant. Haha 🙂 I have exactly same set of camping dishes. They work really well too. I still love my iron skillet. I love stuff like this. If I could, I’d have a house full of cool cooking things. What an awesome gadget! Reading this makes me want to pitch a tent and rough it for the weekend. I haven’t been camping in years! A day late and a dollar short! I could have used this when we camped in the West Virginia mountains this past weekend. I am so picking this up! Great pots and pans. You always find fabulous products. What do you mean you can’t carry baby on the front and ALL your additional gear on the back. You? I can’t believe it. LOL. This is a cool set. We have a camping trailer and we go camping 6-8 times a year. I’ll have to check into it – thanks for the informative review. By the way, don’t blame you for not wanting to go to far with a little one strapped to you. It’s so hard when they’re young! Just bought this set for my husband’s birthday, after he complained he needed somthing like it. Very cool indeed.